Lecturers at 64 universities across the country have been carrying out determined strike action in a high-profile campaign to defend their pension rights. 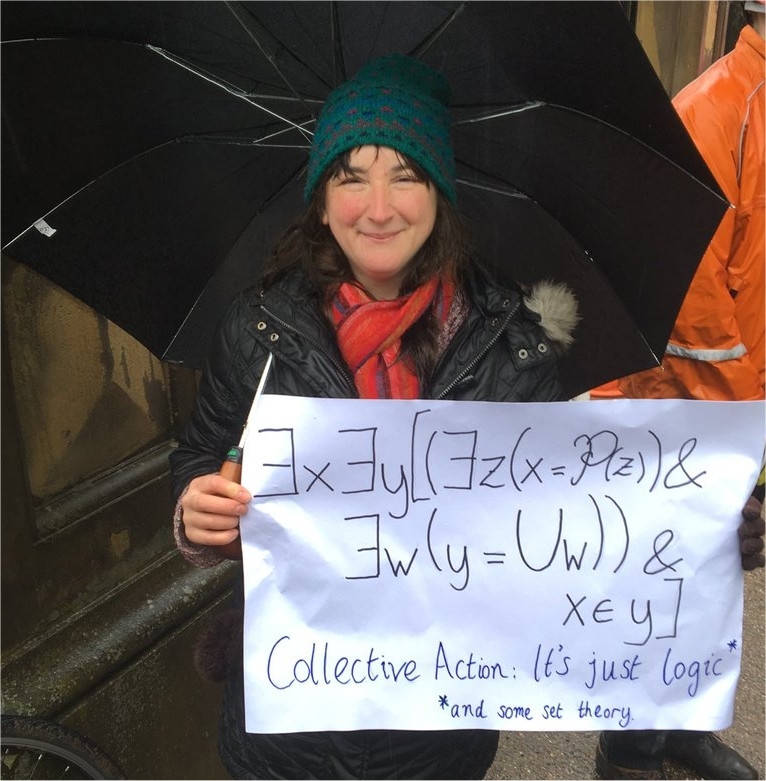 Despite attempts to split lecturers and divide them from students, unity has grown around the campaign and its link with the direction of higher education. The strikes and other action were called in response to proposed changes to the Universities Superannuation Scheme. This pension scheme, which is in place mainly at institutions that were universities before the conversion of polytechnics in 1992, is one of the largest private schemes in Britain with over 400,000 members and more than £50 billion under management. In July last year, it reported a technical deficit of £17.5 billion. Under this pretext, the scheme’s Joint Negotiating Committee proposed to transfer its defined benefits section to the defined contribution section from April 1, 2019. In addition, amongst other proposals, while employer contributions would remain at 18%, 4.75% of this would not actually contribute to pensions but would be used for deficit recovery, plus management and running costs. The Committee included the Universities and Colleges Union (UCU) representing lecturers and the advocacy organisation Universities UK representing the employers. This so-called Negotiating Committee overruled the objections made by UCU to the proposals, who in response successfully balloted for industrial action. The union said that the plans to replace the defined benefit section in particular could leave lecturers £10,000 a year worse off in retirement, and pointed out that younger staff would be worst affected, losing half of their pensions in some cases. The action taken by lecturers was resolute. The first round of strikes ended without conclusion and further action is planned. At the same time, the issue has become generalised to include support staff, from cleaners and porters to administrators and librarians, who are largely represented by the union Unison. “Attacks on pensions for support staff go beyond the current USS dispute,” said Unison head of higher education Donna Rowe-Merriman, adding that staff have been subject to years of real-terms pay cuts. A deal mediated by the conciliation service ACAS between employers and union negotiators on March 12 was overwhelmingly rejected by members. The provisional agreement would have introduced an “independent expert valuation group” to re-evaluate the pension deficit. It would have put the proposed plan on hold for three-years, during which time an interim arrangement would have operated with employers and members paying higher contributions. Talks would have reopened on agreeing a long-term arrangement from 2020, on “risk-sharing alternatives” such as “collective-defined contributions”. However, the deal was met with wide rejection as UCU branches voted against it the following day. An open letter to the leadership of the UCU, signed by more than 7,000 members, called on the union to “reconsider its position”. The new proposals were viewed as a capitulation, with the three-year delay in particular under fire as a tactic allowing the scheme to be changed in the future with reduced resistance. It was certainly no small a concession to allow the deficit to be reduced over that period at lecturers’ expense. “Branches made it clear today that they wanted to reject the proposal,” said UCU General Secretary Sally Hunt. “UCU’s greatest strength is that we are run by and for our members and it is right that members always have the final say. Many members would prefer to turn down the deal and push for a more decisive victory”. Social media posts by UCU members and branches reflected this sentiment, with one describing the deal as “derisory”. Warwick UCU was one branch that quickly came out to reject the deal, saying: “Following our branch meeting this afternoon,” with its near-unanimous vote, “the Warwick UCU position is to maintain the pensions status quo”. The strikes and other industrial action where therefore escalated. Universities were now faced with the prospect of being hit with a second 14-day strike wave, disrupting the exam period. Despite the actions approaching a month in duration and set to continue, and despite active attempts to sow divisions (such as the intervention by Universities Minister Sam Gyimah, who called for students to be given refunds on fees for lost teaching time), unity has been developing between lecturers and students on the basis that the lecturers’ working conditions are students’ learning conditions. The right to a decent education is threatened if the conditions and morale of lecturers are undermined. More generally, there is a consciousness, built on the experience of recent years, that this is about more than pensions: it is a question of safeguarding the future of education. Indeed, the very argument given by university management is that continuing to fund the scheme would mean cuts elsewhere, such as on teaching, research and student support. This points to the nub of the issue. Both education and pensions are viewed as costs, which, on the one hand, fails to recognise that both are rights in a modern society, and on the other, ignores the reality that education is productive work: lecturers produce an enormous amount of value. Education is not a cost and pensions are rightfully a claim on that value that lecturers and others who work in education have created. This value is acknowledged when employers’ organisations such as the CBI bemoan the skills shortage. The modern socialised economy is dependent on the supply of a well-educated technical workforce. Engineers, scientists, and other highly-skilled people do not drop from the skies; they are formed within the educational infrastructure using mainly public assets and teaching resources. Businesses, particularly the large monopolies, do not want to pay for this value on which they rely, but their narrow perspective prevents them from seeing that to cut investment in education, or attack the conditions and claims of staff, is to cut investment in the future productive capacity of the workforce. The unity shown by students is therefore significant. 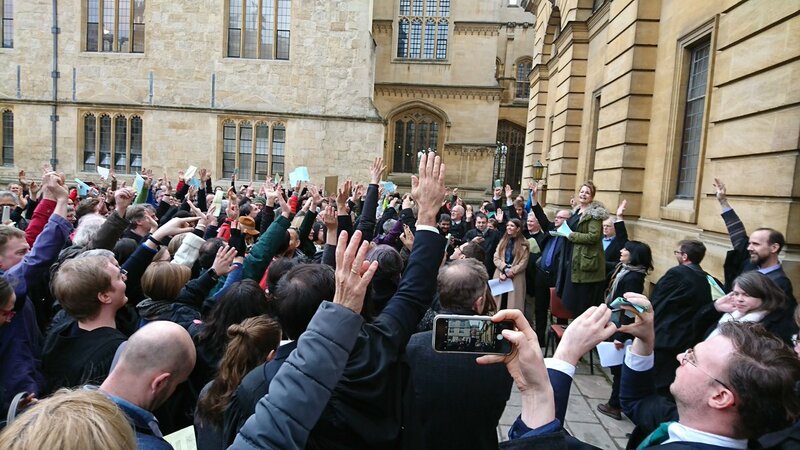 Students have occupied Edinburgh, Bristol, City University London and other universities in solidarity with lecturers. 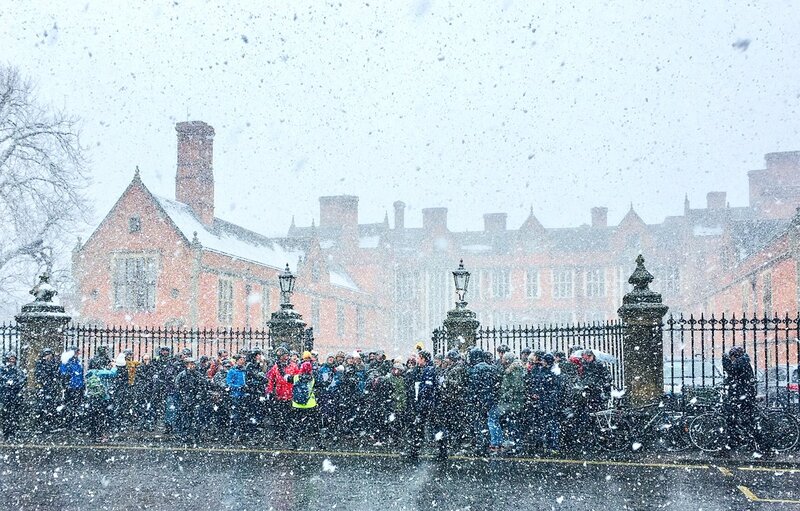 Students joined protests in Cambridge, holding placards which read “students support lecturers” and “education is not a commodity”. 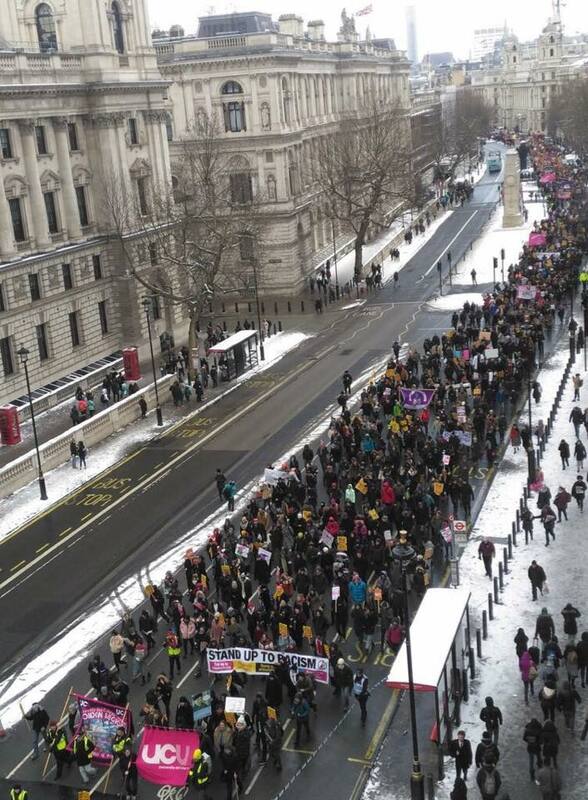 Demonstrations involving lecturers and students have been organised, such as a march across central London in February, and tens of thousands of students at the universities affected signed petitions supportive of striking staff. As has been the way with many such recent disputes, the management policy has been one of imposition, taking a belligerent, confrontational stand. 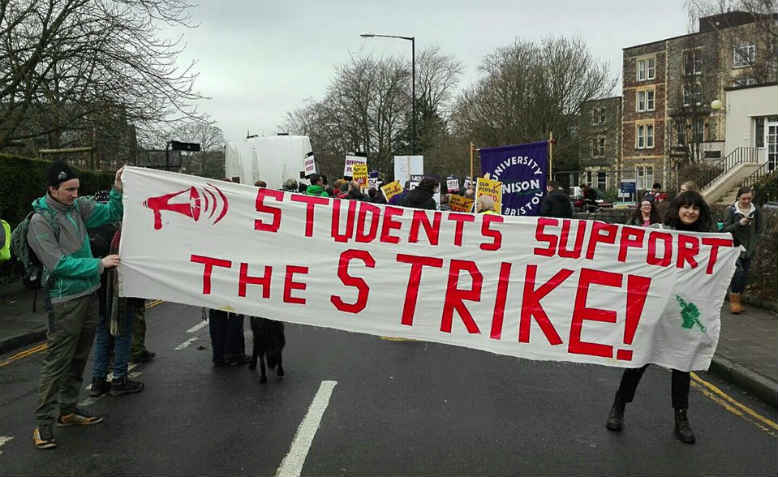 Universities have been making threats of punitive action against strikers. As usual in strike action, staff have lost pay for the lost time. However, in an affront to the right to strike, managements at a number of universities have been insisting staff reschedule cancelled lectures and seminars and make up for the lost strike time, or otherwise face additional pay deductions. The particularly hard line taken by Kent University has reportedly meant some graduate teaching assistants (typically PhD students with some teaching duties to provide much-needed extra income) on low pay have been threatened with being docked more than a month’s wages for missing a handful of days to strike action. Liverpool University, which currently holds the chair of Universities UK, told staff that they are “expected to provide learning materials” for lost teaching time or have this additionally deducted from their pay, while the management of Sheffield University were forced to back down over similar measures after protests. On Friday 23, a new offer was tabled by Universities UK following further negotiations over that week. The proposal is to keep the current pension scheme in place until at least April 2019 while a jointly-agreed panel reviews the valuation of the scheme and its assumptions and associated tests. The deal is being viewed as a significant climbdown by the university management, who have been forced away from their stand of imposition at this time. The issue has exposed the management and raised wider questions about higher education around which students and lecturers have been uniting. Lecturers are remaining vigilant, however, and there is a consciousness that the use of a panel of experts is a tactical move, both to delay and to open up the possibility that its re-evaluation of the scheme could actually be detrimental. Implicit in this struggle has been the demand of lecturers and students for a say and control over matters that affect their lives and the necessity to challenge the core economic assumptions such as the notion of a pension deficit, related to the idea that pensions are costs that have become unaffordable. Universities UK declared that they have a “legal duty” to put in place a “credible plan” to reduce the deficit by this summer. This is simply yet another exposure of a set of arrangements in crisis, used to justify arbitrariness that enforces the monopoly right assumed by finance capital to plunder pensions. It exposes the lack of any public authority that is able to uphold the public right to education and the right of education workers to their claims. This, the attempts at imposition, the attempts to divide, and the general one-sided capital-centric outlook on the pensions issue, are examples of the conditions of disequilibrium that exist at this time. To safeguard the future of education, to guarantee the rights to a livelihood and to maintain a harmonious learning environment for students that is vital for the economy and the future of society, requires a new equilibrium under the decisive say of lecturers and other education staff, with the inclusion of students, in the general interests of society. 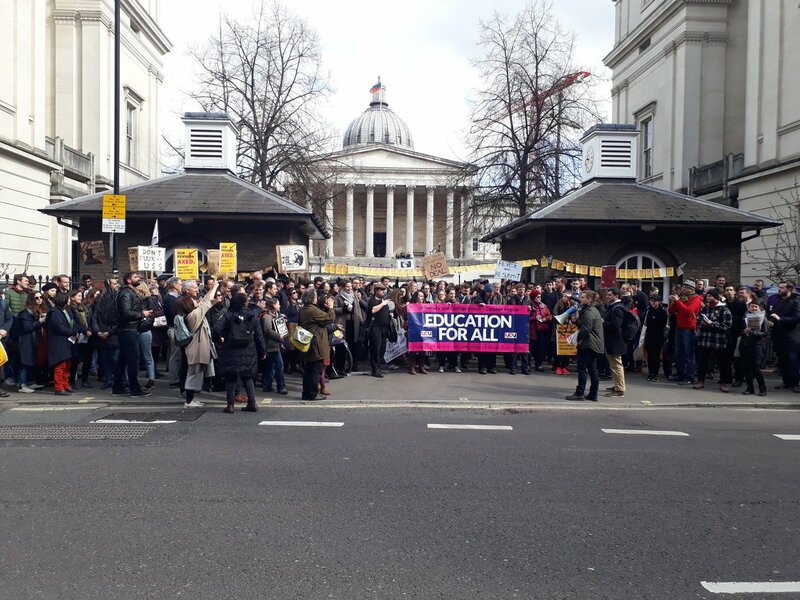 Representatives from UCU branches at the universities in dispute over changes to the USS pension scheme and the union’s higher education committee (HEC) met on Wednesday, March 28. After seeking some clarification, including that the defined benefit element of the scheme would be maintained while a joint-expert panel considers the valuation of the USS fund, HEC voted to put the proposals to members in a ballot. The ballot opened on Wednesday, April 4, and will close at 2pm on Friday, April 13. The union has said that because of the rules under the Trade Union Act it had served notice of strike action at 13 universities to begin on April 16 as part of a fresh wave of industrial action aimed at targeting the last weeks of teaching, and the exam and assessment period. Twelve universities will be hit with a full week’s strike from Monday 16 – Friday 20 April. Bangor University will be out on 16, 17 and 19 April.